The first day of 2011 Full Camp for Our Washington Nationals was nothing short of serious. 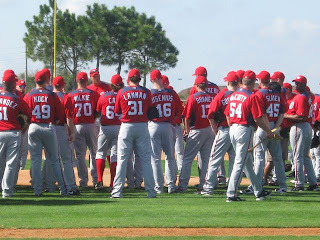 Not a lot of laughter, just 59 players going about their business as dictated by Our Manager Jim Riggleman and his 21 assistants in Viera, Florida. Riggleman met with his players before practice began in the Space Coast Stadium Clubhouse. 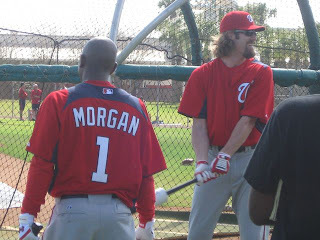 He chatted with them on the field before the start of the first official workout and even met with everyone again in the clubhouse after all the drills were completed. 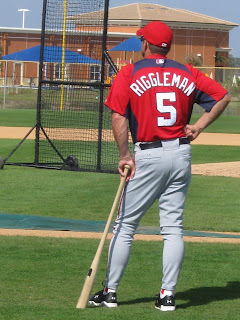 Asking his players to not only meet expectations but exceed them, Manager Jim was setting the tone before the very first pitch was thrown or the first ground ball was hit. Five weeks before Washington steps out onto the field at Nationals Park to take on The Atlanta Braves--their field manager wanted everyone to know that the final results over the past four years were no longer be acceptable. 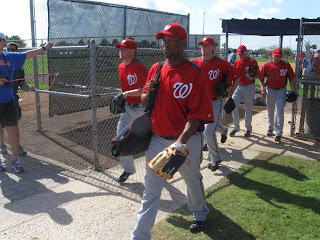 Time to step it up boys and become competitive in the National League East. Everywhere you looked this morning around the Space Coast Stadium practice fields every player was diligently working through their routines. 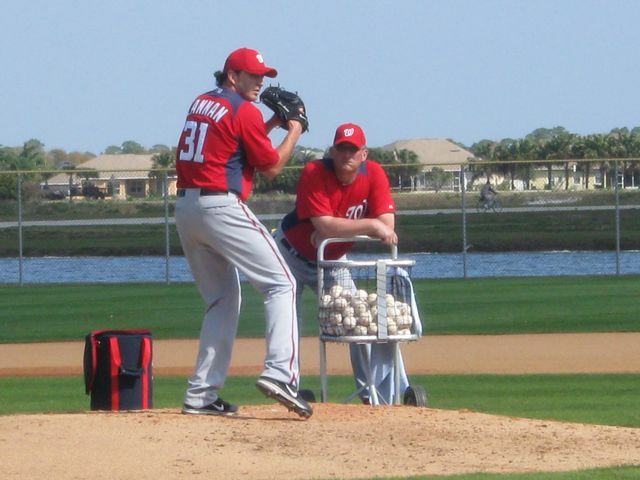 On the first day of Full Camp, John Lannan, Craig Stammen and Yunesky Maya were a few of Washington's pitchers that threw live batting practice. 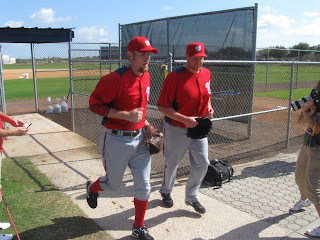 "Nothing like it," said Stammen while heading back to the clubhouse after his workout. 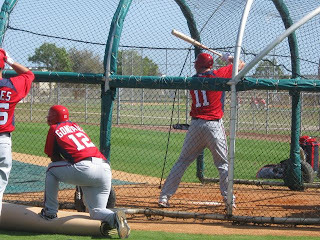 "Throwing BP to hitters gets the competitive juices flowing. It lets you know the season is just around the corner. I loved it! I really did!!" 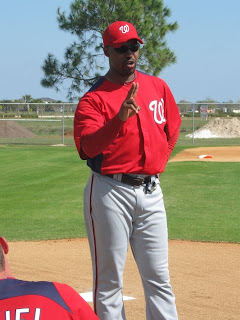 New 3rd Base Coach Bo Porter introduced himself by explaining to each successive player group how he handles his duties giving signs: "I am not out here to trick you, only to help you." This after working Washington's outfielders through a completely different set of drills--one of which included running with a football. Porter seemed very authoritative. 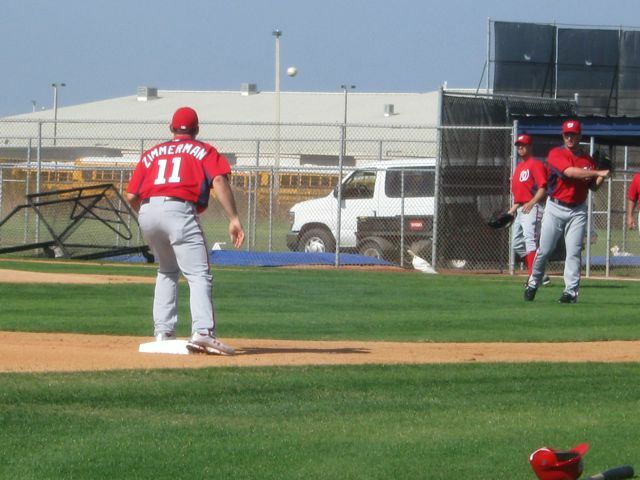 Bunting techniques were taught as were the standard infield drills, as well as the expected conditioning skills that finish off each and every training session. The First Day Of Full Camp For Our Washington Nationals found everyone getting down to serious business. Jayson Werth has quite the beard and long hair. Jordan Zimmermann cracked us up when we asked him whether he saw the story written about him in today's edition of The Florida Today Newspaper. "Yeah, only because it was sitting in the clubhouse this morning." 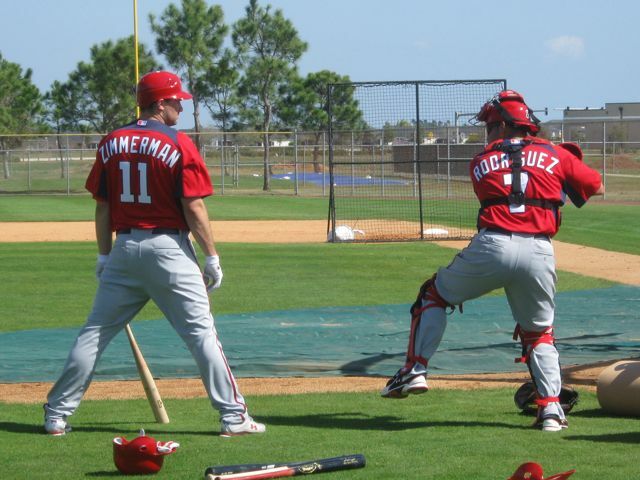 J-Zimm says he never goes out the way to read any news accounts of him or anybody else. "Not necessary." Sean Burnett mentioned to Sohna that he talked with Matt Capps just two days ago. 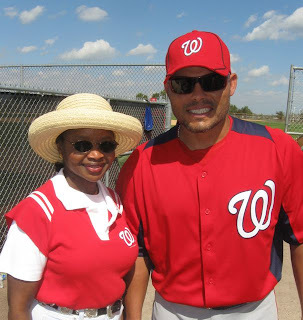 As many Nats Fans may already know, Washington's former All-Star and closer now pitches for The Minnesota Twins (traded for Catcher Wilson Ramos). "He's in a really good place right now," stated Burnett. "Everything for him really turned out better than he expected." Burnett and Capps are still today really close friends. 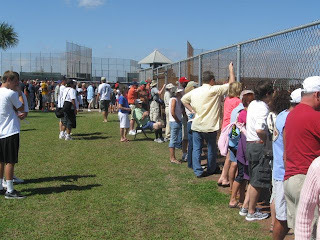 The autograph line maintained its integrity after practice concluded when Pudge Rodriguez signed or took pictures with anyone wishing to meet him. A far cry from yesterday's scene with Bryce Harper. Today, a special rope line was initiated by security that didn't allow line cutting to happen. 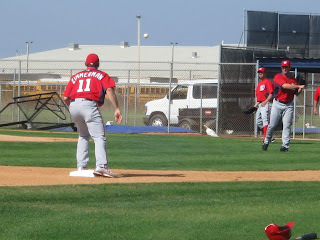 As for Harper and Werth, they were motored by golf carts back to the clubhouse today after the workout--well away from fans. An absolutely gorgeous day in Central Florida. Temperatures in the high 70's, a light breeze. 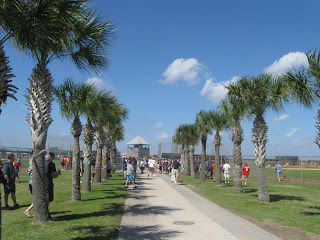 Perfect for attending practice--which a few hundred fans did this Tuesday morning. And finally, Darlene and Dave made their first appearance of 2011 at Spring Training in Viera this morning. 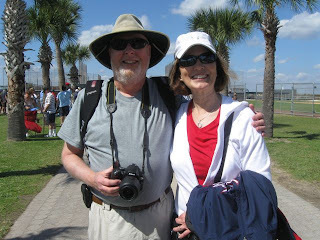 We first met this wonderful couple at the Space Coast Stadium Practice Fields three years ago when we took a picture of them shaking hands with then manager Manny Acta. 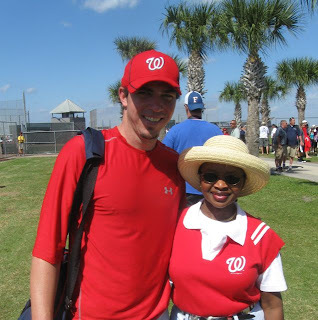 Sohna and I learned they were, like us, diehard Nats Fans who live in Northern Virginia. We been good friends with them ever since and enjoy getting together with them whenever possible. P.S. 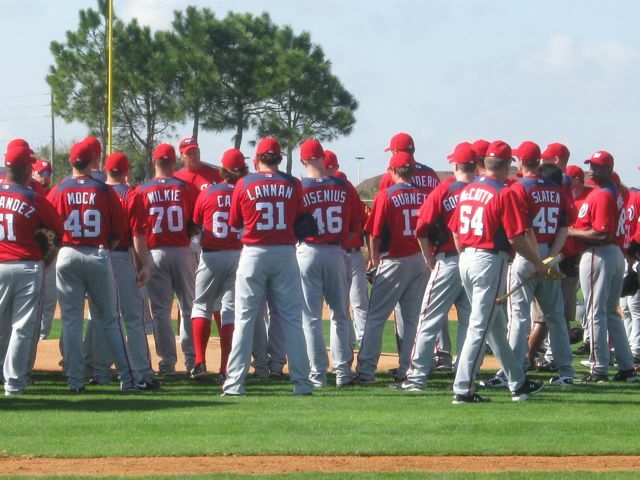 We've been gathering our usual player interviews, a standard of Nats320's annual Spring Training Coverage. Three were completed today, four are in the can and more are on the way. 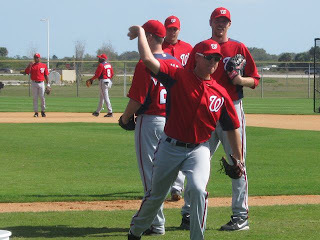 Once we transcribe all of them, they will begin being posted right here on Nats320. Wish we were there..couldn't make it this year.